American, ca. 1840-1860. Oil on canvas. 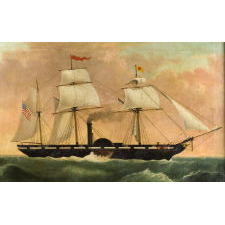 Steam-powered sidewinder sailing ships first came into service about 1840. 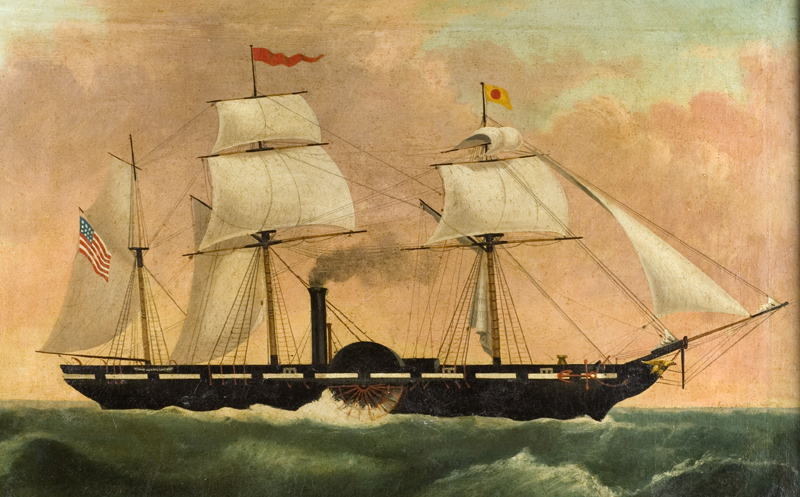 Initially, these ships were only marginally faster than wind-powered clipper sailing-ships and were prone to mechanical failure and fuel shortage. As such, these early paddlewheeler's were typically fitted with a full complement of masts, rigging, and sails due to the captain's mistrust of the new steam technology......By about 1860, technology improved to the point that they were reliable enough (and now significantly faster than sailing-ships) such that the sailing apparatus, including spare sails, rope, and all things needed to sail were eliminated. A benefit of eliminating sails and support supplies was that there was now more space for passengers and the storage of materials for their comfort and other amenities......This painting is a superb depiction of one of these early hybrid sailing and sidewinder ships. 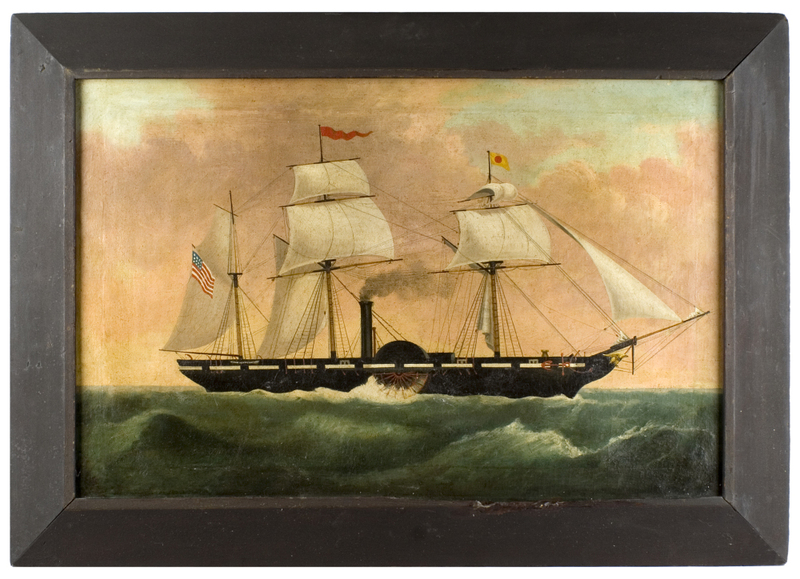 Note the beautiful eagle figurehead (sailors "believed" that the sharp eyes of the eagle would be constantly on the lookout for perilous shoals), and the large anchor attached to the side. 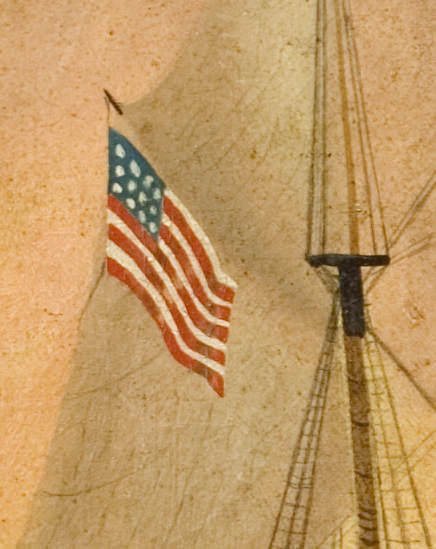 A bold American flag alerts of the captain's pride. The ship cuts cleanly through wind-swept seas. 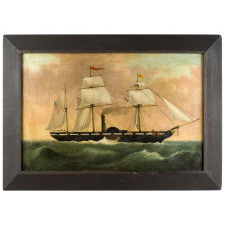 The warm tone of the sky is well balanced by the aqua-green of the swirling waters, with dashes of color from flags, figurehead, and anchor......Terrific condition, with very minor in-painting. Chamfered black painted frame appeaers original (with a bit of repair on the lower frame edge). Overall frame size is 35.75 x 25.25 inches. 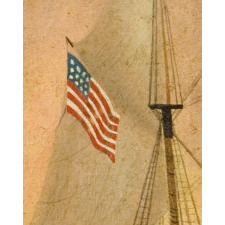 Sight size is 29.25 x 19 inches.....Provenance: Important New England collection, and previously Stephen-Douglas; Robert Thayer.